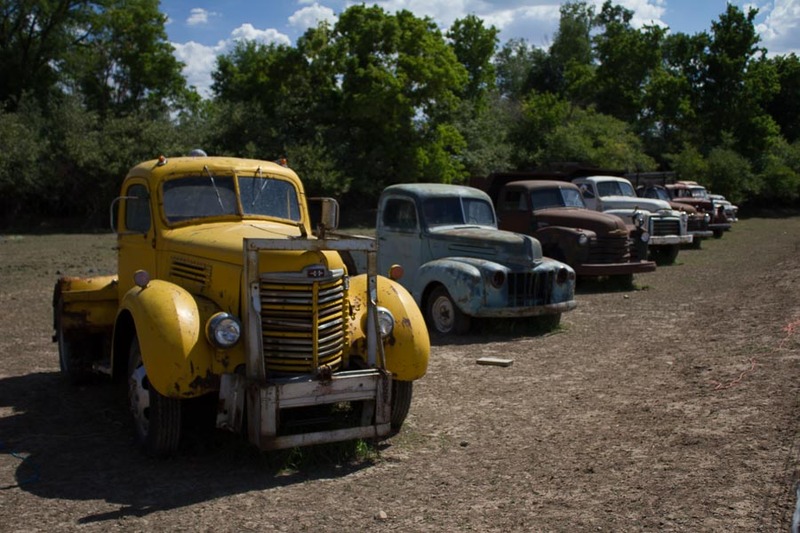 I look at a row of trucks, like the ones above and they make me daydream. I dream of hitting the road, perhaps doing a Route 66 type of tour to meander through Main Street USA. I dream of being in the backroads, just exploring and seeing what’s over the next hill. I dream of the windows down, wind hitting my face and it’s a beautiful day outside. Of course, I also dream that I could actually drive and park a big truck like that, although I didn’t do bad with my daughter’s Toyota Tundra! The two hardest tests on the spiritual road are the patience to wait for the right moment and the courage not to be disappointed with what we encounter. I love this quote, especially as my life is in change right now during my job search. It’s hard to be patient, but it is a good trait to have. So is staying encouraged. It’s easy to get disappointed, so it’s better if I stay focused on the acts of kindness people are doing for me, from strangers who are part of the process of looking for a new job to old and new friends who reached out to stay in touch. Stacy at Visual Venturing does an ABFriday Forum, in which participants are invited to take a picture and do their interpretation of post-processing it. What you see above is my submission, using an original photograph submitted by Emilio Pasquale at Photos by Emilio. Correction in Lightroom for color, contrast, etc. Minor cloning out of some clutter in the foreground. Ran it through Topaz Clarity to clean it up and bring the colors up more. I ended up using Clarity Micro Burst 2. I further post processed it with Topaz Impressions, using Cezanne 2 with modifications. Lastly, I ran it through Topaz Effects, using the Pop filter and creating a border that used a color in the grill of the blue truck. I actually did several variations (below). I liked both of them also, but the one at the top ended up as what I submitted. I like the old trucks, and what you have done with them. Thanks Patti! They really are special and now that I’ve done two of the After & Before Challenges, I’ve become a regular! I love the quote Nancy. I put it in my journal – I also love what you did with that photo. A story about what you created would come through so easily – well it feels like staring at the photo you processed opens the door to more creation. Thank you! That’s a great compliment that it opens the door to more creation. Glad you liked the quotes also. I find the best ones on Goodreads! Wow Goodreads? Good to know!! Brainy Quote is often good, but Goodreads is much more unusual. What a wonderful post, I enjoyed reading it! And your edit is so beautiful, summery….just what I needed in this gloomy, wet January. As for Topaz, I would really like to use it, it looks so interesting. Thank you! I’m glad it gave you a few minutes of enjoyment. Topaz has 30 day trials and also run sales at times throughout the year (after Thanksgiving especially). Nancy, I love what you did with the trucks. Your version takes me back to my college days; San Francisco and the summer of love, psychedelic, man! Oh, wait, who’s memory is that? I’m not telling! Because I was there for those days too. . . which makes us how old?? I really thought that your processing version stood out for me. The painterly effect was so pleasantly shocking that it immediately struck me as original and thoughtful. Really, really well done! Thanks Shane – what a wonderful compliment! I knew when I saw those trucks that I wanted to really bring out the color. So yes, it did turn out bright and I’m glad you liked it. I’ve been using Topaz for a while, although Impressions is fairly new. I’ve been happy with it. Here’s a different one that used the pencil effect. The original is below in the post. It’s pretty good, but busy and not very special. The pencil effect (I thought) improved it to a special photo. I like that phrase – technicolor impact! It certainly does show off those colors. Thanks Dor! A nice, painterly effect. I like your result. Nancy, based on your image, I’m definitely going to have to try out Topaz!! I absolutely love the effects you chose, and that you even have Ben saying he likes it is huge :) Yours was a great one to end the gallery with – so colorful and bright, it just put a smile on my face. Thanks so much for participating! Thanks Stacy! That’s a wonderful compliment. Yes, I did notice Ben liking it despite not wanting to and that is quite a compliment from him. I loved the colors on it also, which is why I had to try out something in Topaz to bring it up and hide that it as slightly soft in its focus. I like Topaz and have tried all kinds of changes from them. You can overdo it, like anything, so I try to be careful because I want to end up with something I like, not something that shows what a technical whiz I am (or am not!). Great job with the photo. You gave the trucks more personality than was already there! Thanks Corina! I think you’re right – it does have a lot more personality afterwards! Romance and adventure sounds great! Thank you! We could be sisters! My husband and I do the same thing – we just hop in the car and start driving just to see what’s there. There being defined as anywhere. It IS a great way to explore. Sometimes it bombs and sometimes we find some really neat stuff. I could never imagine Cezanne using this as a subject and it is an interesting angle for this picture. I have used topaz for basic effects but have never used their artistic ones, I will need to check them out. Overall your edit is really interesting and works well and something that I would not normally like. I laughed when I saw your comment! I think you’re right that Cezanne would not have used this as a subject. I appreciate the compliment that you liked the edit even though you normally would not have. I am careful (usually) to make it look better versus making it look very edited and overdone. Some photographers do a great job of that and I enjoy seeing their technical skill, but I don’t like the final end product. Topaz does have 30 day free trials, so give it a test run and see what you think. Good choice with the one you submitted, I don’t have any Topaz programs but I like the painting effect here, it really looks like an old master effect where you could see all the brushstrokes. Nice job! I started using Topaz Labs several years ago when my post processing skills were so poor. It helped me improve my pictures even though I didn’t know what I was doing. Since then, my post processing in Lightroom and Photoshop has improved greatly. I still like Topaz though. It gives me effects I can’t get on my own. The Topaz Impressions that makes it look like a painting is my favorite lately. I like how it converts the picture to a painting. They do have free 30 day trials if you’d like to give it a test. Wonderful pictures. Those colors pop! Thanks Ashley! Getting the colors to pop was what I was trying for, so I’m glad you noticed it. I like them both, but the one you chose is my favorite. Nice editing, I like the changes. Thanks Mary! Yours was great also, especially with converting it to black & white and then coloring back in the front truck. Stacy really had a great response to that picture. Thanks Cee! I liked yours too (I haven’t made it over yet to tell you – sorry about that). I’d tried the desaturated look and really liked it, but felt this one was a little brighter. I loved what all Stacy showed – people really did a good job on it and the subject was great. Of course, you have a bunch of them in your inventory to do. I’m jealous!! I need to start finding some trucks and cars to take pictures of. 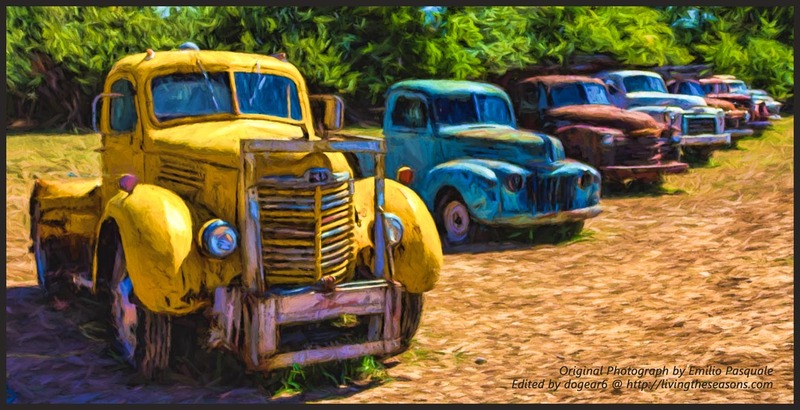 These trucks gave me fond memories of the trucks my dad had on the farm.I love what you did with the picture. Now it looks like a painting. Great job!! I am also learning patience. Something I have never had much of. Yeah, patience is definitely an acquired taste (and skill). I’m glad you liked the truck painting too. In the original photograph, none of the trucks are sharply focused. Using the Topaz plug-in helped cover that up and really perked up the colors too.